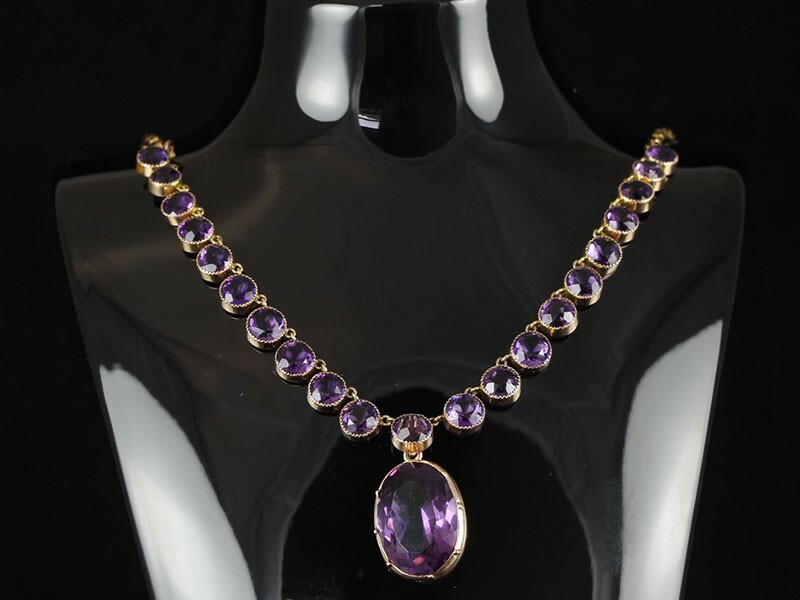 This stunning Victorian Amethyst 9 carat Gold riviere is circa 1800. The riviere, or "rivers of light" is a simple, elegant design where stones are set one following the other joined with a simple ring. 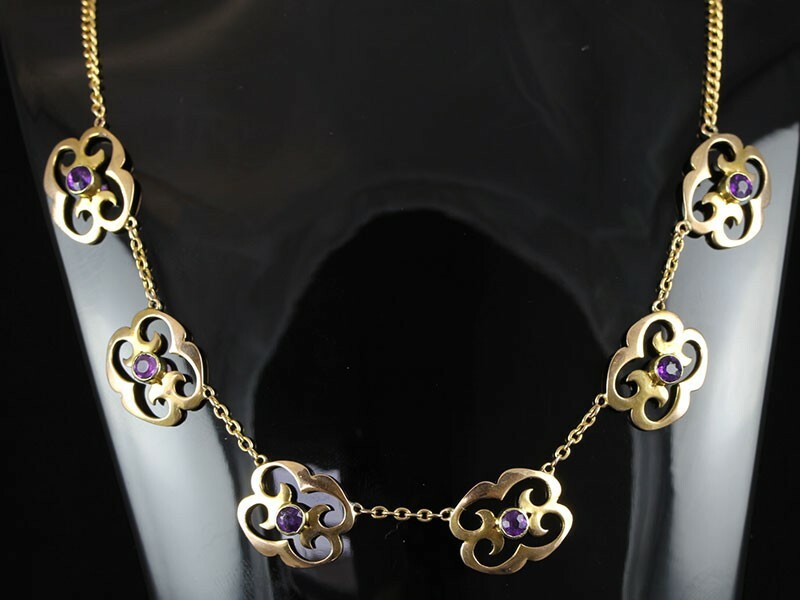 A beautiful rare one-of-a-kind Arts and Crafts Amethyst necklace lovingly created in 15 carat yellow Gold. There are 7 vibrant, collet set, deep royal purple Amethysts, althoghter weighing 0.70 carats. 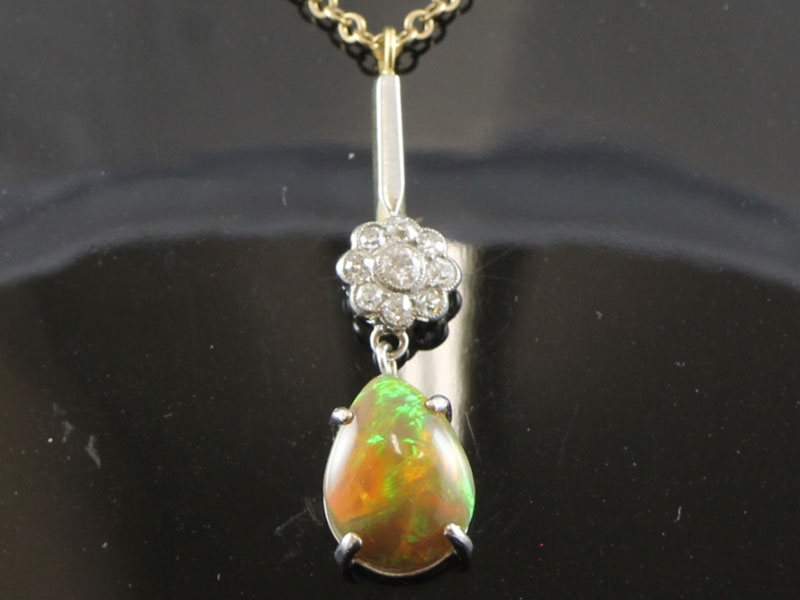 A charming necklace full of character and life. 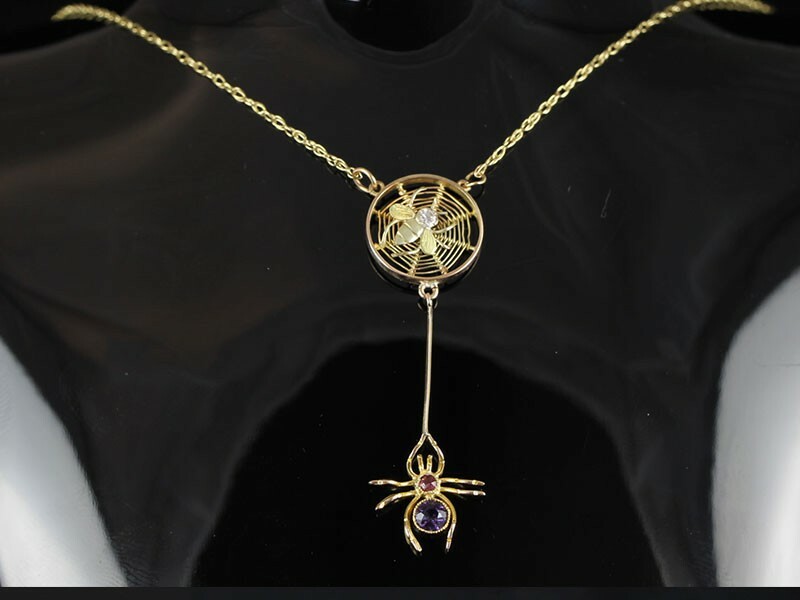 There's a lot going on in this lovely and highly detailed necklace, a celebration of nature. 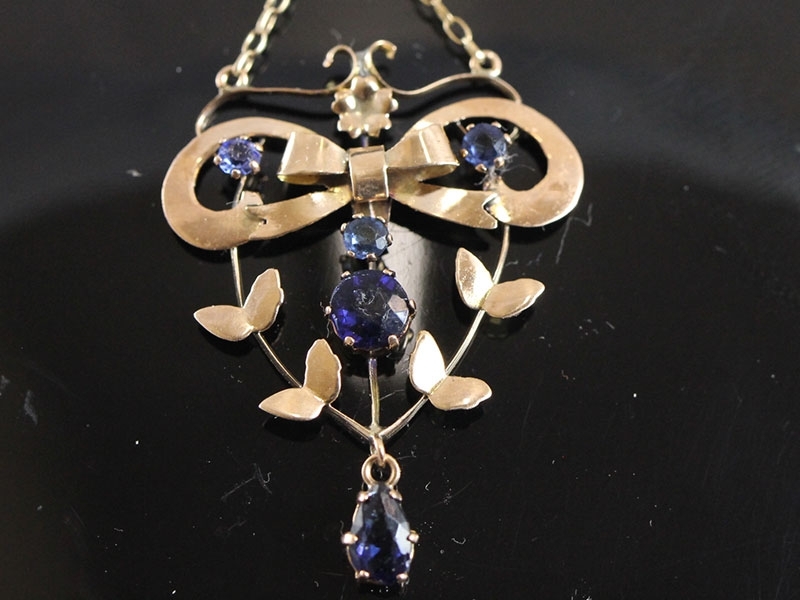 A stunning piece of Edwardian jewellery which will be very much admired. 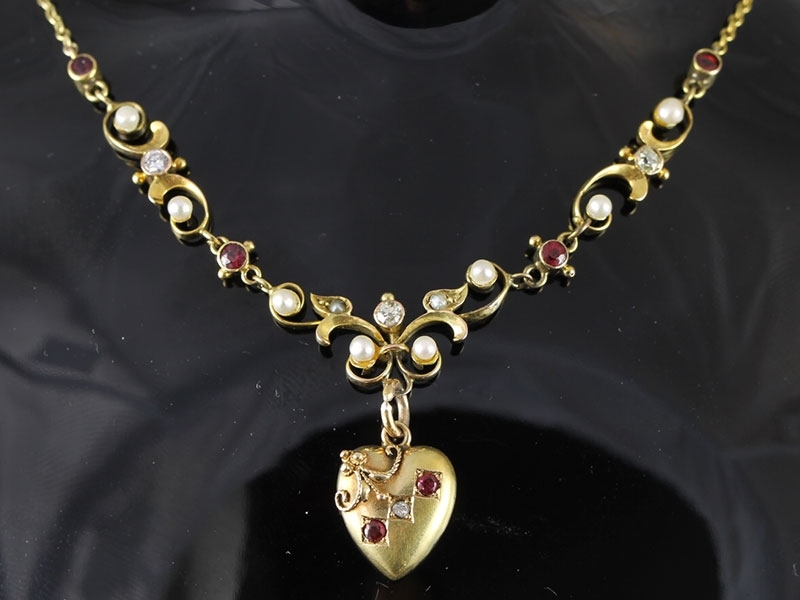 The necklace is collet set with Pearls, Rubies and Diamonds leanding to a solid Gold Ruby ad Diamond heart pendant. 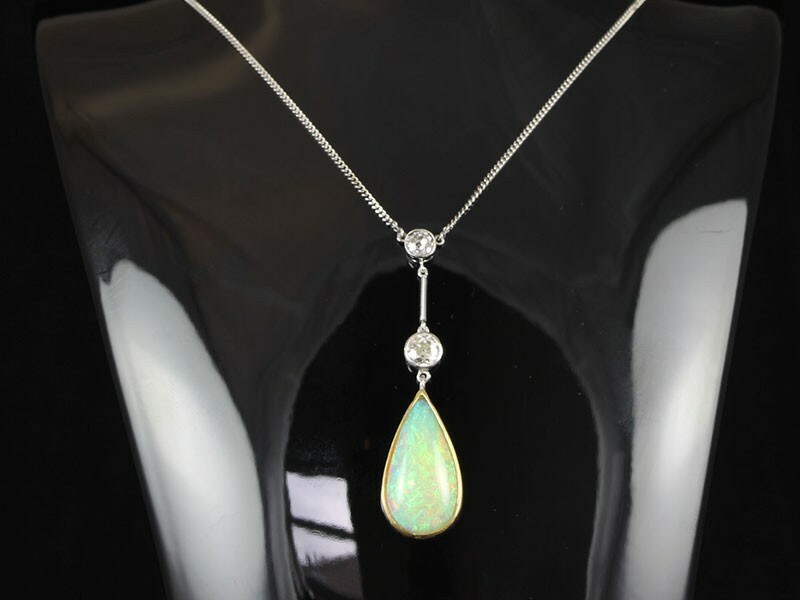 This is a beautiful Edwardian Pendant Circa 1910 handcrafted in 9 carat Gold. 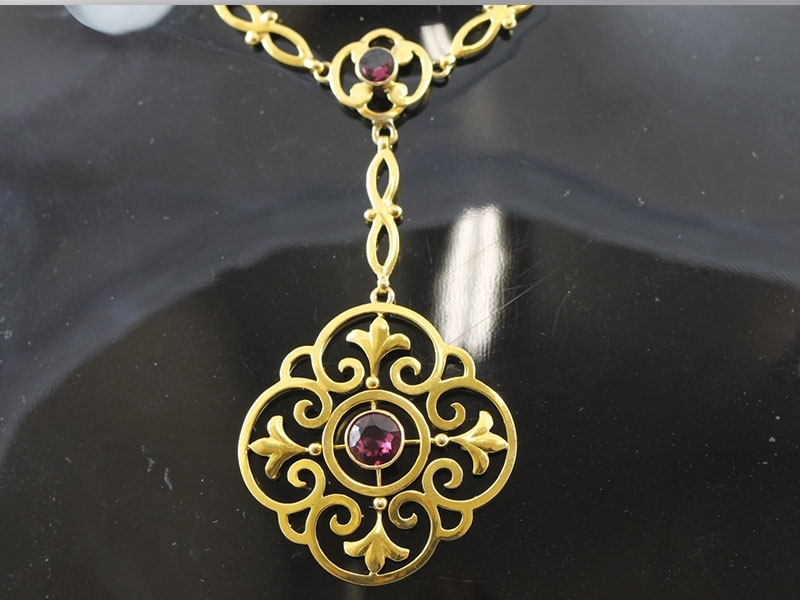 From mid-nineteenth century England comes this rare and enchanting Bohemian Garnet and Diamond necklace. Lend romantic style to your everyday look with this very unique item from the 1920's, and one of a kind! 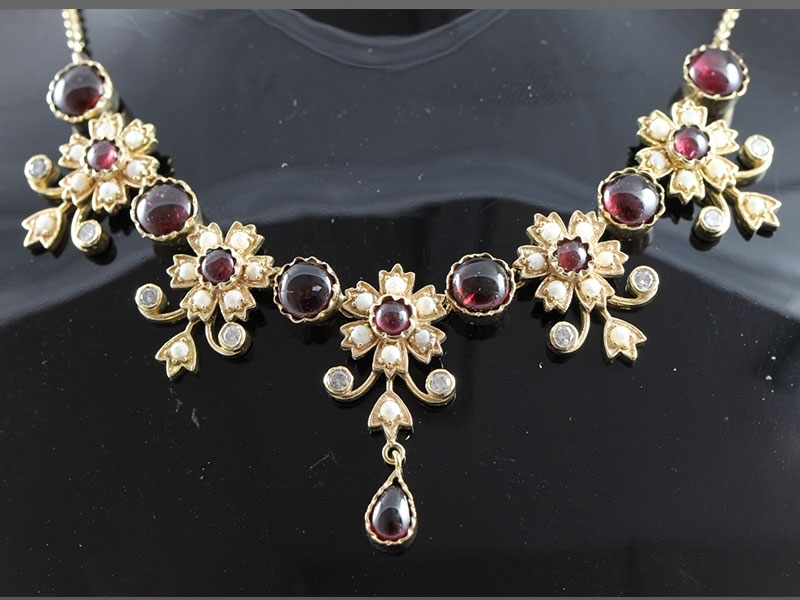 An Edwardian garland of Garnets, Diamonds and Pearls, simply lovely. 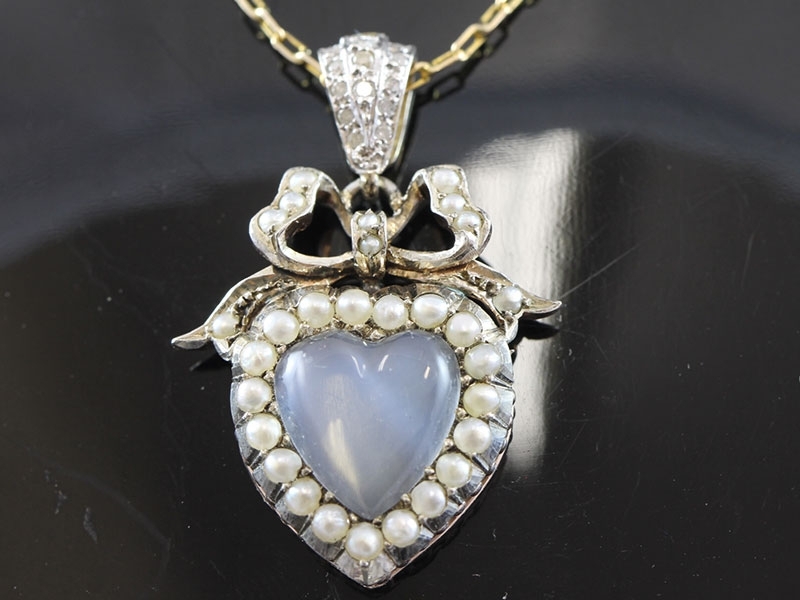 Romantic Edwardian heart shaped Moonstone within a halo of natural Pearls. 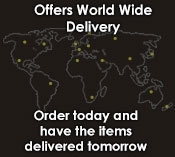 It's your guarantee of quality and beauty. 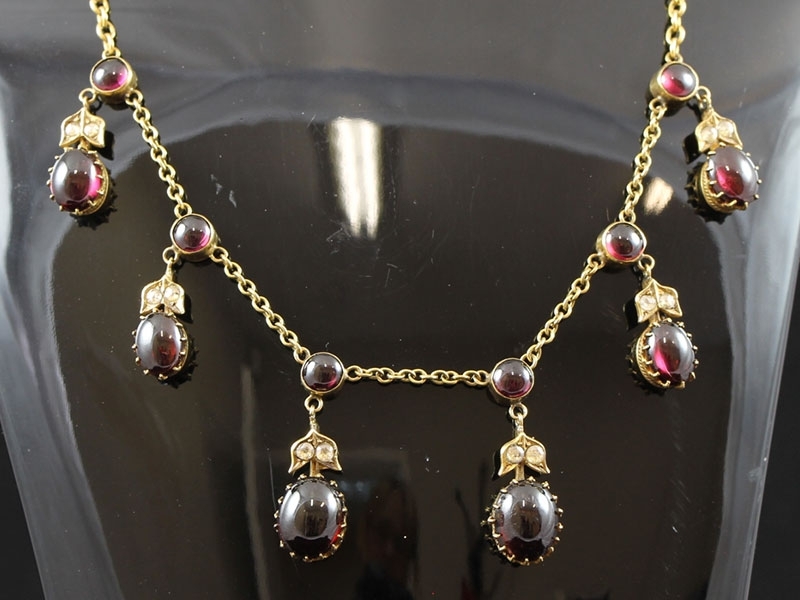 This elegant Edwardian era 9 carat Gold necklace features two round Almandine garnets. 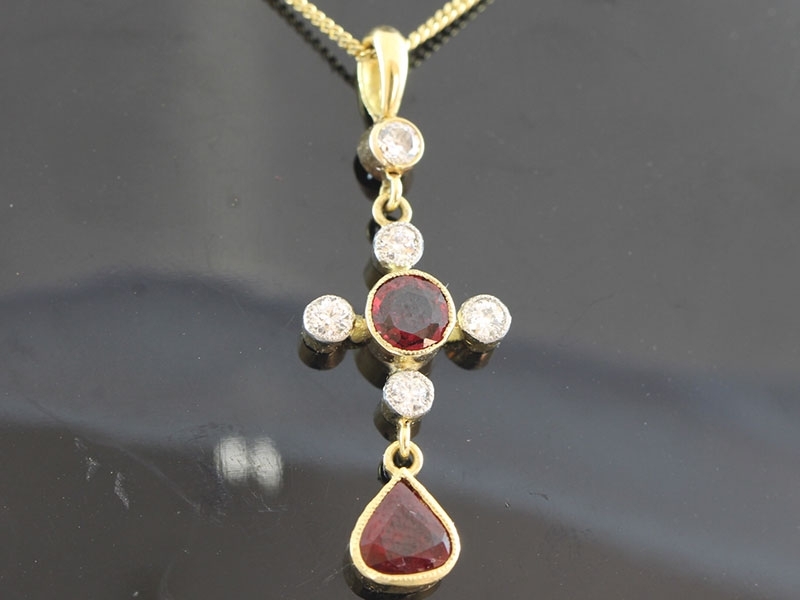 A stunning antique Edwardian Burmese Ruby and old cut sparkling Diamond yellow Gold pendant and chain forms part of our diverse antique jewellery collections. 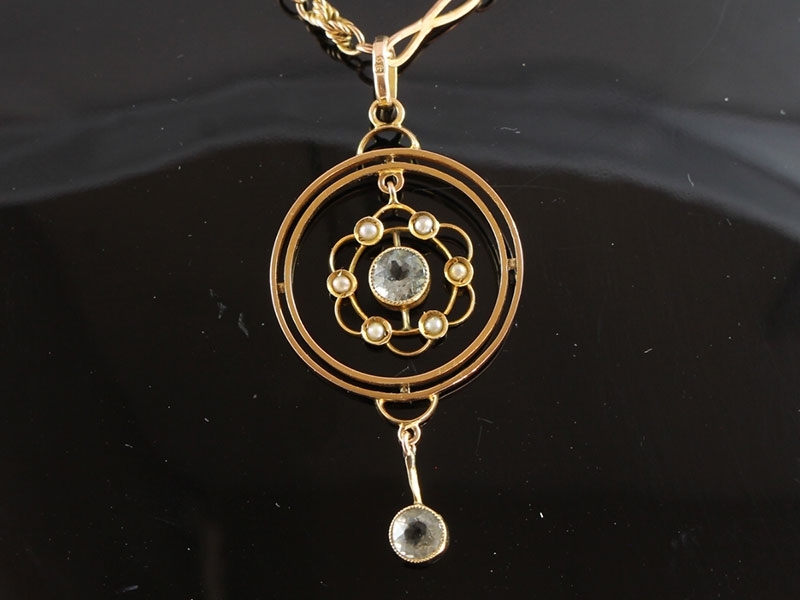 This is outstanding, a fabulous Edwardian 15 carat yellow Gold pendant is truly beautiful. 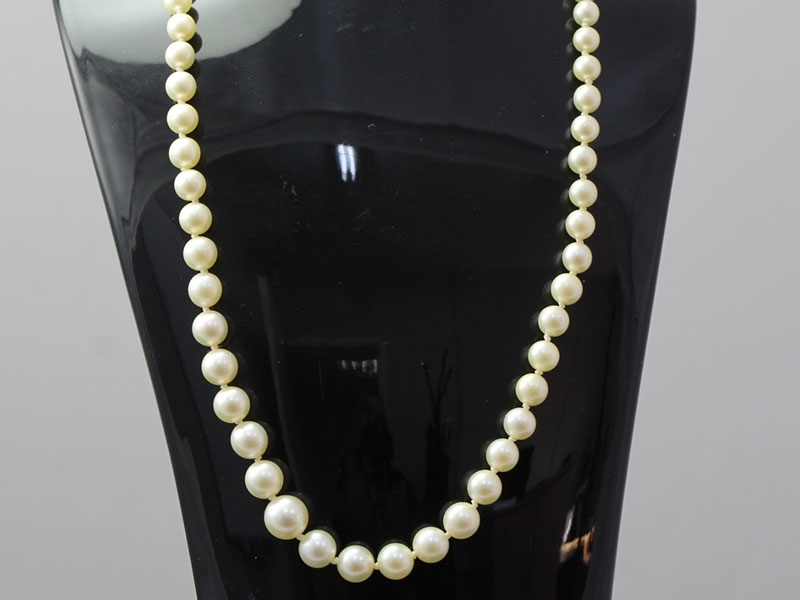 An opulent graduated Pearl necklace which is classy and versatile, Circa 1920's. 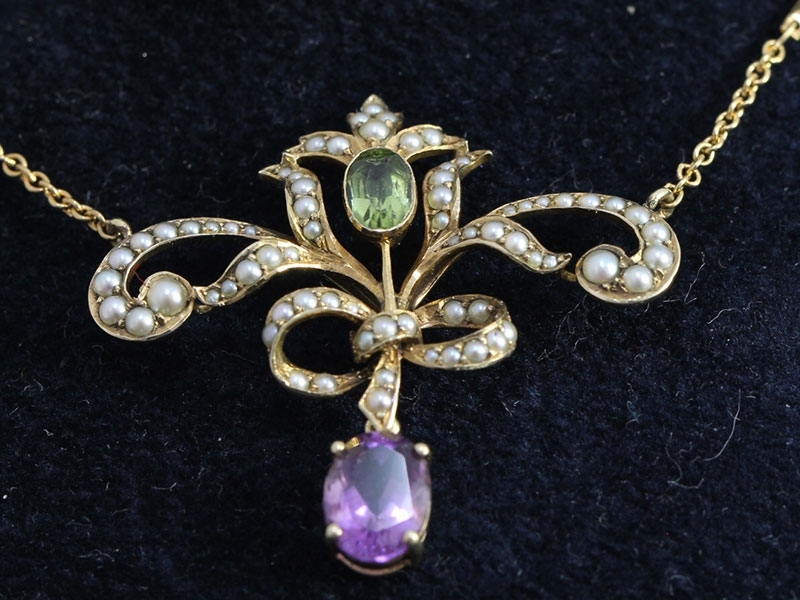 Antique Suffragette Gold Necklace with Amethyst Peridot and Pearls Edwardian Period Stunning! Circa 1910. 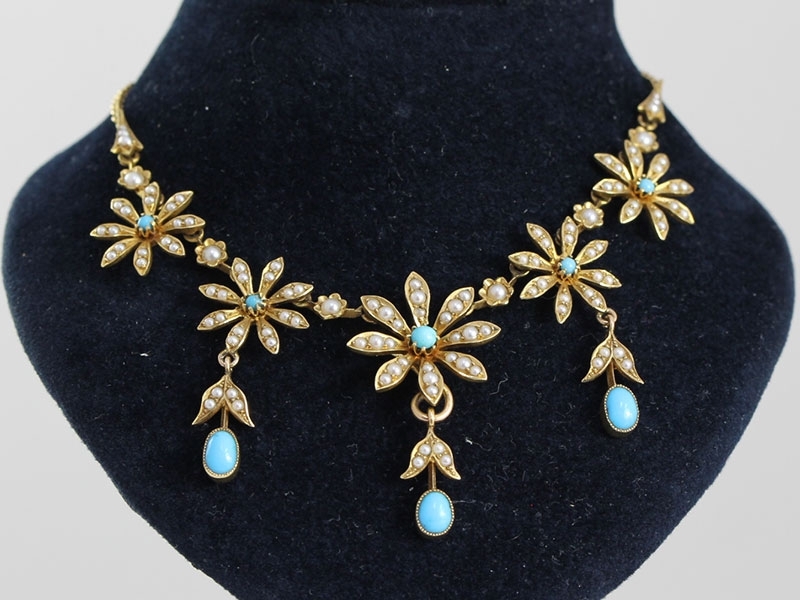 Fabulous Edwardian 18 carat Gold Turquoise and Pearl and floral necklace, Circa 1910. 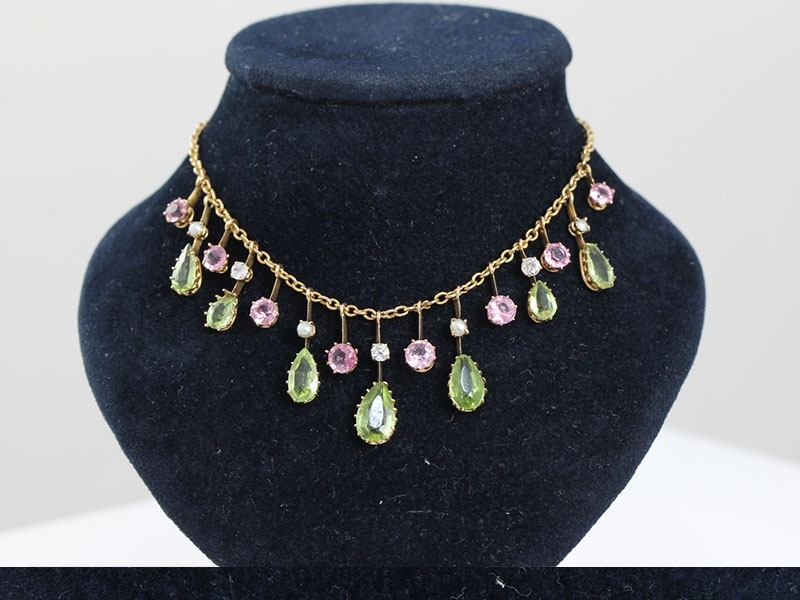 Antique Suffragette Gold necklace with pink Topaz, Peridot, Pearl and Diamond Edwardian period is simply stunning! 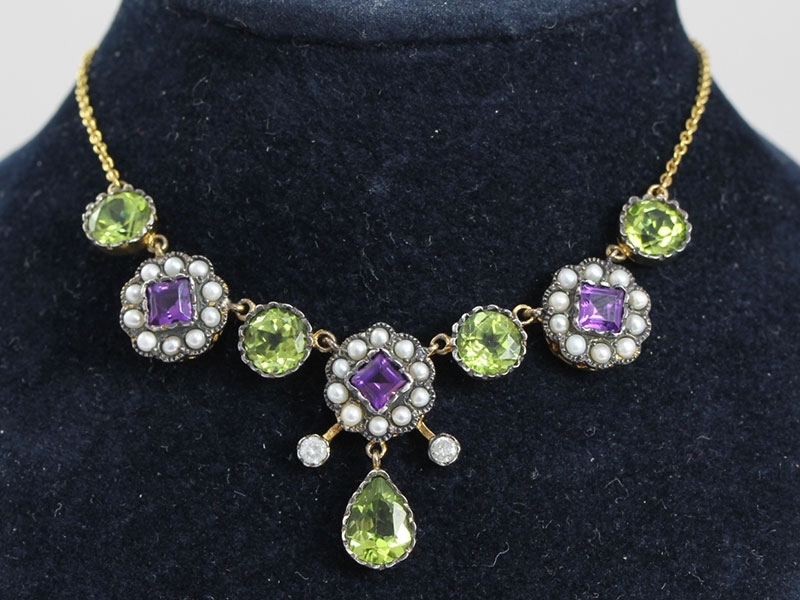 Antique Suffragette Gold Necklace with Amethyst Peridot Diamond and Pearls Edwardian Period Stunning!